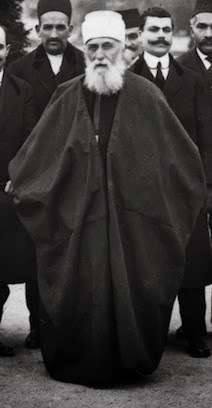 "‘Abdu’l-Bahá . . . met with many visitors, including a militant suffragist. A number of suffragettes came to see him during His two visits to England. One, the famous Emmeline Pankhurst, called ‘Abdu’l-Bahá a ‘prophet’, whereupon He said, ‘Oh no! I am a man, like you’. Apparently Mrs Pankhurst was ‘much cheered by her interview, for the Master told her to continue her work steadfastly, for women would very shortly take their rightful place in the world’. He advised the militant who visited him on 19 December that women who were campaigning for the right to vote should refrain from any acts of violence in their efforts, but should ‘use the power of intelligence, with scientific accomplishments, with artistic attainments. Unseemly deeds would rather retard the realization of their cherished hope. In this age a weak person resorts to frightful measures, but an intelligent person used the superior power of intelligence and wisdom.'" I think what is also part of this story, though not included here, is that this feminist chose to dress in men's attire--and that is one reason 'Abdu'l-Baha referred to being a "man" like her!